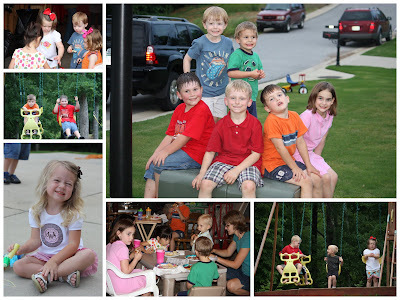 shelly's summary: Sunday School Social! We had a great time Saturday afternoon/evening at our Sunday School Social! We had a BIG shrimp boil aka Low Country Boil at one of our classmates house (which was actually down the street in our neighborhood). We had a great time with lots of good food and adult conversation. The kids also had a great time (if you can't tell from all their sweaty faces/heads) playing football, basketball, on the swing set, in the bounce house, with sidewalk chalk, and lots of riding toys too. Fun Times with Good Friends! And last but not least the Happiest Baby on the Planet... sweet baby C always SMILING!